Ticks are a fact of life for many dog owners that live in the Northeast. A tick spreads disease by attaching itself to an infected deer. After feeding, they jump off the host and after digesting the blood, look for a new host. Diseases spread by ticks include Lyme disease, a bacterial infection called ehrlichiosis and Rocky Mountain Spotted Fever. Only 5% of infected dogs show symptoms. Ticks tend to stay on high grass and plants looking for their next host. When your dog (or yourself) walks by, the tick jumps on and attaches itself. 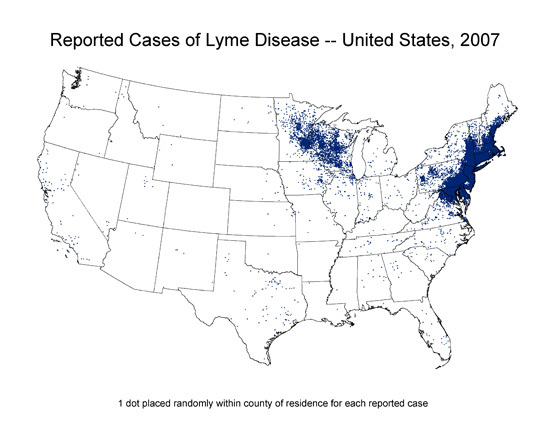 Map of Areas With Lyme Disease in the U.S.
Young ticks look for small animals such as rats as hosts. If you keep your backyard free of debris and food (such as by making sure your garbage cans remain closed or in the garage), then small mammals will not stay in your backyard. With no animal to feed on the young ticks cannot survive. If you have mice in your area, you can put a product called Eco Health Damminix Lyme Control Packs around the outside of your house. Mice will be attracted to the packs to create nests. The approach will not harm the mice, but will kill ticks and fleas that live in the nest. You can also soak cotton balls with Permethrin to achieve the same effect. Also keeping your grass cut will make it more difficult for ticks to jump on a host. When they are low to the ground, it is more difficult to jump on the host. If you are planning to take your dog for a walk in an area that may have ticks, consider using a protective repellent spray such as Frontline Spray or use Frontline Plus before going. These products contain pyrethrin, a product that is used to safely kill and repel ticks. Frontline Plus is a liquid which is applied along your dog's back. The product will seep into the skin, providing your dog with protection from ticks that carry dogs Lyme disease. When you get your dog home, you can also give her a bath using a shampoo designed to kill ticks. Use a flea comb to remove any ticks that are caught in your dog's coat. Be sure to inspect your dog after going outside to prevent dogs Lyme disease. If you remove the tick in under 24 hours, then you greatly reduce the chance that your dog will come down with Lyme disease. If you do spot a case of ticks and dogs, use tweezers to grab the tick by the head and pull away from the dog in one steady motion. Don't twist your arm, just pull straight out. Put the tick in a canister of alcohol, in case the tick needs to be tested for Lyme. Some towns in high tick infestation areas will test your tick for a small charge. Be careful not to touch the tick to avoid transmission of any problems to yourself. Blood test for antibodies related to the bacteria B. burgdorferi.A test called a SNAP is used to determine if your dog has been exposed to Lyme disease. This does not mean your dog actually has the disease. Other tests include ELISA (detects antibodies created by the body to attack bacteria) or FA. Treating Lyme disease involves the use of antibiotics (Doxycycline). Once the tick is removed and treatment has begun, in most cases you should see improvement in 24 hours. In more severe cases improvement may take longer. Drugs such as Tetracyclines, penicillin, and macrolides bring long term relief from symptoms, but do not completely remove the infection from your dog's body, but brings the levels down to where symptoms in most dogs do not reappear. There is also a homeopathic remedy available for additional support. Since the bacteria carried by ticks is carried by blood cells, remedies focus on the liver and the blood. One product worth researching is called PetAlive TF-Defense Formula. It contains ingredients such as milk thistle (silymarin) which is an anti-oxidant. The most common need for treatment involves canine arthritis which is treatable. Approximately 15% - 25% of dogs that are treated for Lyme induced arthritis tend to develop future infections. Lyme can be fatal if it causes kidney disease or if it triggers a heart problem. A vaccination is available to protect your dog which can be used in tick infested areas. Vaccinations need to be repeated yearly to keep the required of level of antibodies in your dog's body.